Pennsylvania may not be home to a major art market like New York City, but, nevertheless, many famous artists have hailed from the state. One need look no further than Andrew Wyeth (1917-2009), who is one of the best-known American painters of the mid-20th century. This realist painter used scenes in and around his hometown of Chadds Ford, 30 miles west of Philadelphia, as the subject of many of his works. His most famous work, “Christina’s World,” is in the collection of the Museum of Modern Art in New York City. Wyeth, whose father N.C. Wyeth was a well-known illustrator and son Jamie Wyeth is a successful contemporary realist painter, received the National Medal of Arts in 2007. Following in the footsteps of Andy Warhol was Keith Haring (1958-90), who was a friend of the famed Pop artist from Pittsburgh and also had a connection to the city. Though he grew up in Kutztown, just outside of Reading, Haring began his art career here in 1976, moving to Pittsburgh to attend the former Ivy School of Professional Art, a commercial art school then located at University Avenue on the North Side. However, after realizing a career in commercial art was not for him, he soon dropped out, and after having his own exhibit at the Pittsburgh Arts and Crafts Center (now Pittsburgh Center for the Arts) in 1978, he, like Warhol, left for New York to attend the School of Visual Arts. It was the countless drawings he made with chalk on blank paper panels throughout New York’s subway system between 1980 and 1985 that would garner him attention, and by the late 1980s, with numerous exhibits behind him, he became one of the most famous graffiti artists of the 20th century. Actually, the list of Pennsylvania artists who have risen to prominence stretches pretty far back in history. Philadelphia-born John Peto (1854-1916) became quite the heralded artist despite the fact that he never had a gallery exhibition during his lifetime. A tromp l’oeil painter who was a contemporary of America’s other famous 19th-century tromp l’oeil painter, William Harnett (1848-92), Peto contributed regularly to annual exhibitions at the Pennsylvania Academy of the Fine Arts in Philadelphia, where he and Harnett studied art in the 1870s. Both artists were masters of this genre of still-life painting that aims to deceive the viewer into mistaking painted objects for real ones. 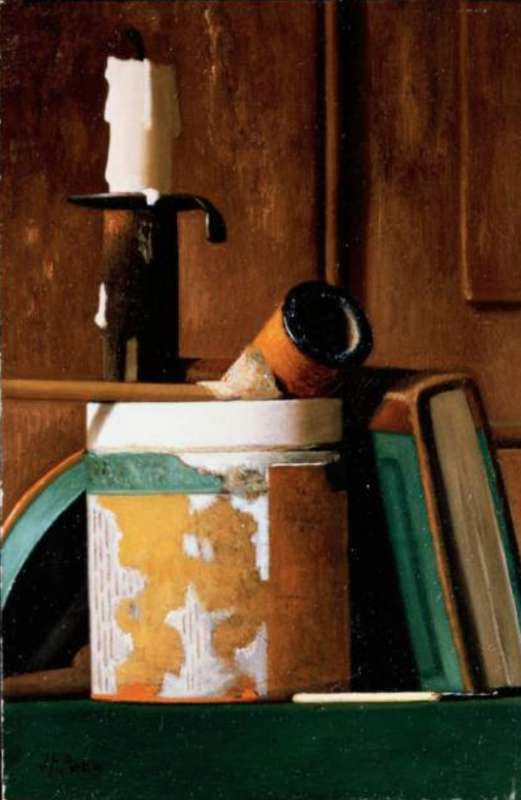 The term trompe l’oeil means to “fool the eye,” and, to do this, one of Peto’s tricks was to paint the objects in his still-lifes to actual size. Though he never became rich and famous by today’s standards, he did make enough from his art to build his own home and studio in 1890, and in 2011 the John F. Peto Museum was opened in his former home in Island Heights, N.J., and furnished to look as it did when he lived there. Like Peto and Harnett, many famous American artists studied at the Pennsylvania Academy of the Fine Arts and many of them studied under Philadelphia-born Thomas Eakins (1854-1907). Eakins is one of the most famous names associated with the academy and widely considered to be one of the greatest American artists of the 19th century. A passionate realist, he is perhaps best known for his painting “The Gross Clinic.” Painted in 1875, it is a massive oil-on-canvas, measuring 8 feet by 6 1⁄2 feet and housed in the collection of the Philadelphia Museum of Art. The painting signified the advent of surgery as a healing practice in this country and secured the career of the young artist, who submitted it for exhibit in the 1876 Centennial Exhibition in Philadelphia. The Pennsylvania Academy of the Fine Arts played a prominent role in the development of artistic careers well into the 20th century. A member of the Ashcan School who painted the gritty urban life of New York City, John Sloan (1871-1951) was born in Lock Haven and attended Central High in Philadelphia, along with fellow artist William Glackens and art collector Albert C. Barnes. Sloan studied briefly the academy before finding work as a newspaper illustrator, first for the Philadelphia Inquirer (1892-95), then the Philadelphia Press (1895-1902). In 1902, he moved to New York where he worked as a magazine illustrator. But in 1904, he met influential artist Robert Henri, who became his mentor. And along with Henri and other prominent artists focused on urban themes, such as George Bellows, Rockwell Kent and Edward Hopper, they became known as the Ashcan School. Artist’s associations to their fellow artists often give rise to prominence. This certainly can be said of Alice Neel (1900-84), a portrait painter born in Merion Square, along Philadelphia’s prominent Main Line. Known for her expressionistic portraits of friends, family, lovers and strangers, her most famous work is her 1970 portrait of Andy Warhol in the collection of the Whitney Museum of American Art. A haunting portrait, it prominently features scars across his chest from the assassination attempt carried out by radical feminist writer Valerie Solanas two years earlier. Neel, whose career lasted from the 1920s until her death in 1984, was renowned for exposing the inner psychology of her subjects and for being an astute, sometimes brutally honest, observer of people, to which this painting can surely attest. There’s fame, but, then, there is eminence. And in that category, the state boasts none other than Alexander Calder (1898-1976), the son and grandson of sculptors already quite famous themselves. Of all of the artists to come from the state of Pennsylvania, none is more famous than Calder simply for one reason: He invented the mobile. What is a mobile, you may ask? All you need do is look up at Calder’s mobile “Pittsburgh,” which hangs high above the air-side central atrium at the Pittsburgh International Airport for the answer. That whirligig-looking contraption is his, and he invented this form of art in 1931. The “Pittsburgh” mobile was originally designed for the 1958 Carnegie International exhibit and was moved to the airport in 1959. Except for a stint at the Carnegie Museum of Art during the construction of the current terminal, the mobile has been greeting travelers at the airport ever since. Among living artists, there is none more famous in this country than Jeff Koons, and he, too, is from Pennsylvania. Born in 1955 and raised in York, he still lives and works between there and New York City. Like Warhol before him, in the 1980s he set up a factory-like studio in SoHo and staffed it with more than 30 assistants. Today, his factory is near the old Hudson rail yards in Chelsea, and he employs between 90 to 120 assistants. And, like Warhol, Koons is a pop artist who mines popular culture for inspiration. Beginning in the 1980s, Koons transformed objects such as basketballs, vacuum cleaners, liquor decanters and inflatable toys into works of art. Just this fall, Koons broke a world record for a price paid for a single artwork by a living artist. His sculpture “Balloon Dog (Orange)” fetched $58.4 million at a Christie’s New York auction in November. Not bad for a kid from York.